In1940, there were pockets of religious persecution in Thailand. In the village of Songkhon, seven Catholics were martyred . In 1940 before the Japanese invasion of Thailand there was a reaction against things Western and foreign. In this atmosphere there were pockets of persecution of Christians. This led to the martyrdom of seven Catholics in the village of Songkhon in north-east Thailand. They were beatified by Pope John Paul II in 1989. Patrick Duffy tells their story. The first missionaries to Thailand were Portuguese Dominicans who in 1554 arrived in Siam, as it was then known. Siam was a Buddhist kingdom, but Christians were welcomed as bringing new knowledge. By the 19th century most Catholic missionaries were from the Paris Foreign Missions Society (Société des Missions Étrangères de Paris – MEP), living in enclaves and exempt from national jurisdiction and taxation. During the 1930s Western influence decreased, and there was a growing sense of crisis as Japan invaded China and threatened south-east Asia. The country’s name was changed to Thailand in 1939. The government adopted a nationalistic and anti-western stance, and Christianity was branded “the foreign religion”. 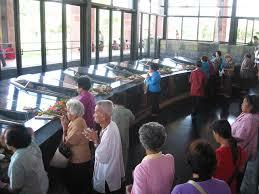 Churches and schools were requisitioned, and Thai Christians were put under pressure. The Vichy Government established after the fall of France in 1940 allowed the Japanese to set up bases in northern Vietnam, and the Thai government responded by invading French Indo-China (present-day Laos and Cambodia). Japan invaded Thailand in 1941 to secure bases to advance into Malaya and Singapore, and the Thai government signed an alliance that lasted until the Japanese were defeated in 1945. 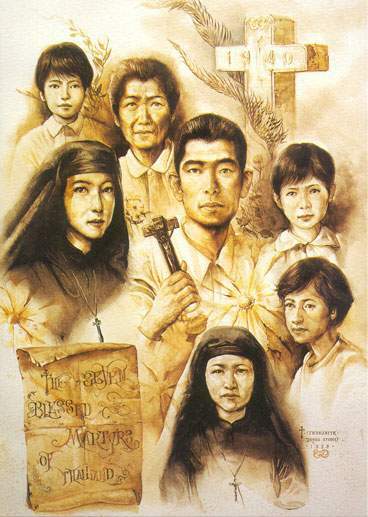 In this tense atmosphere preceding the Japanese invasion the usually tolerant Thais found “the foreign religion” an easy scapegoat, although Catholicism had been in Thailand for over three hundred and fifty years. In the winter of 1940 the police moved into the village of Songkhon in the north-east, near the Mekong River, which formed the border with Laos and Cambodia. All the people in this village were Catholics. The police banished and deported the parish priest. Then, shooting guns in the air, they went from door to door intimidating the people, ordering them to abandon their faith in Christ. Naturally the people were nervous and frightened, but they remained quiet and continued to practise. Local catechist Philip Siphong gave moral and physical support, visiting each family, praying with and encouraging them. He received a letter asking him to go to meet to the Sheriff of Mukdahan. On his way, as he passed through a forest, he was ambushed, tortured and shot. It was 16th December 1940. Villagers recovered his body. The two nuns of the Congregation of Lovers of the Holy Cross, Agnes Phila and Lucia Khambang, continued catechising in the village school, telling their pupils that Philip was a martyr. Police continued harrassment, firing guns in the air and shouting insults. They told the Sisters to dress as proper Thai women and to stop teaching Christianity. Yesterday evening you received your order to wipe out, definitely, the name of God, the Only Lord of our lives and minds. We adore Him only, Sir. A few days earlier, you had mentioned to us that you would not wipe out the name of God and we were rather pleased with that in such a way that we put away our religious habits which showed that we were His handmaids. But it is not so today. We do profess that the religion of Christ is the only true religion. Therefore, we would like to give our answer to your question, asked yesterday evening which we did not have a chance to respond to because we were unprepared for it. Now we would like to give you our answer. We are asking you to carry out your order with us. Please do not delay any longer. Please carry out your order: We are ready to give back our lives to God who has given them to us. We do not wish to be the prey of the devils. Please carry out your order. Please open the door of heaven to us so that we can confirm that outside the religion of Christ no one can go to heaven. Please do it. We are well prepared. When we will be gone, we will remember you. Please take pity on our souls. We will be thankful to you and will be grateful to you for it. And on the last day we will see each other face to face. Do wait and see, please. We keep your commands, oh God, we wish to be witnesses to You; dear God. We are: Agnes, Lucia, Phuttha, Budsi, Buakhai, Suwan. We would like to bring little Phuma along with us because we love her so much. We have already made up our minds, dear Sir. A young girl in the line named Suwan was willing to become one of the martyrs. But her father, hearing what was happening, rushed to the scene and rescued his daughter, despite her pleas and her clinging to Sister Agnes. The others continued singing hymns and praying. When they arrived at the cemetery, the police shot them. The villagers, watching the scene from the bushes, rushed in. 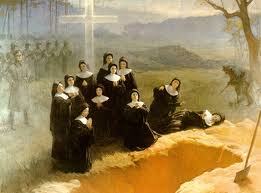 Sister Agnes and Phorn were still alive, but badly wounded. She called back the police and they shot them dead. Another young girl called Sorn saw that her clothes were splashed with blood, but had no bullet wounds. The bystanders told her: “You’d better run home”. So she did, and lived on in Songkhon into the late 1990s. She was an excellent catechist. The only punishment the Chief of Police received was to be transferred to another station. After a canonical investigation into the case of these seven Servants of God, reports for consideration of their beatification and canonisation as martyrs of the Church were sent to the Sacred Congregation for the Causes of Saints in Rome. In a great ceremony in 1986 in the Church of the Holy Redeemer in the village of Songkhon the remains of all seven were re-interred. Pope John Paul II beatified them in Rome on Mission Sunday, 22nd October 1989. Blessed Maria Phorn, 14 years old.